A project to transform Littlehampton town centre could receive millions of pounds if the plans receive Government backing. Arun District Council has bid for £2.5million from the Coastal Communities Fund (CCF), with a decision due this spring. If successful the grant would be matched by other public and private funds totalling £3.3million. 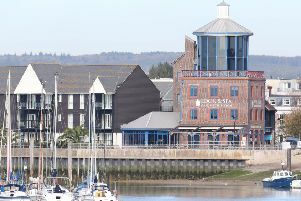 The project would see public realm improvements in the High Street area to improve connectivity between the town, riverside and seafront as well as creating safer and more intuitive pedestrian routes. A previous bid to the CCF for £4.9million was rejected by the Government back in early 2017. The aim is to attract more and higher-spending visitors to Littlehampton so that the town’s businesses are sustained and can grow. The proposals are due to be discussed by the council’s cabinet members next Monday (March 4). Officers are seeking authorisation to progress the project if it secures the Government funding. The town‘s public realm is ‘dated, poorly laid out and uncoordinated’, according to an officers’ report. They described how pedestrian routes from the railway station towards the town centre ‘are not obvious and road crossings are tricky’. Design plans for the town centre show five distinct areas set for improvements. The first would aim to create a new identity to arrival at Littlehampton via the railway station, with new seating, planting and lighting. New raised and paved crossings at the Arundel Road roundabout would look to infer pedestrian priority. Meanwhile in the High Street itself the project would aim to de-clutter the street scene and add new high quality materials and furniture. The entrance to The Arcade would be enhanced and changes would also be made to the Beach Round roundabout. A consultants’ report looking at plans to regenerate Littlehampton explains how although the town is proud of its maritime identity and history this theme portrayed in the street furniture is considered ‘outdated’. Last week town councillor Derrick Chester criticised Arun for cancelling a Littlehampton regeneration sub-committee meeting as it had ‘nothing to discuss’ this month, with the next one scheduled for June. But he was told there were no formal reports to discuss, while the committee was not the only one which dealt with Littlehampton matters.